Like many people I am a chocoholic. Give me hot chocolate fudge cake, dairy milk, chocolate biscuits, anything really and I am one very happy lady! But saying all of this the chocolate things I avoid seem to be chocolate bars (like mars bars, twix) and things like creme eggs. The reason I think I’m like this is because I kid myself a little, a chocolate cake is surely better than a whole mars bar right?! So when it came to Easter and I was given a 6 pack of Cadbury Creme Eggs, I ended up thinking I would have them until Christmas. Instead of leaving them though I decided to bake them into gorgeous yummy cupcakes for my whole family. These were delicious and I swear baked Creme Eggs taste so good! 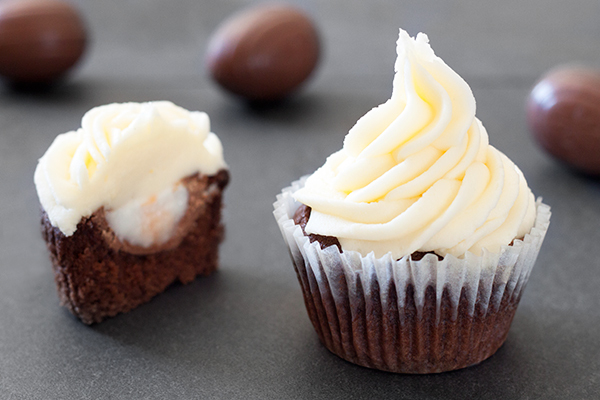 This Cadbury Creme Egg Cupcake recipe is made a little different to how I usually make basic cake mixtures. I wanted a moist cake that isn’t too complicated to make so I mixed the cocoa powder with water and I think it did the trick. How do you make a cake super moist without having a huge list of ingredients? Please let me know by leaving a comment, I love new ideas :). The recipe I used for the butter cream is from The Great British Showstoppers Book which is a book I defiantly recommend. Also if you are interested I used a large piping nozzle which I got from Lakeland Plastic :). Happy Baking! Pre-heat the oven to 180c and put your cupcake cases in to your cupcake tin. Mix the cocoa powder with the water until it makes a nice smooth paste. Add the butter and mix again until it makes a thick paste. Add one egg at a time with a little flour each time and mix in. Once both eggs are mixed add the rest of the flour and mix. Spoon your mixture into your cake cases (around a third too a half of the case should be full). 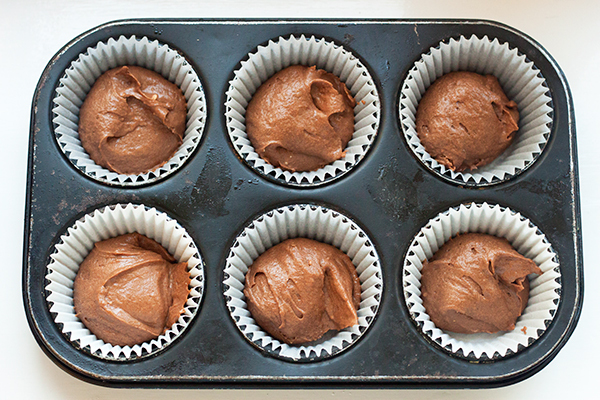 Bake your cakes for around 6 minutes (around half baked) and then take them out. 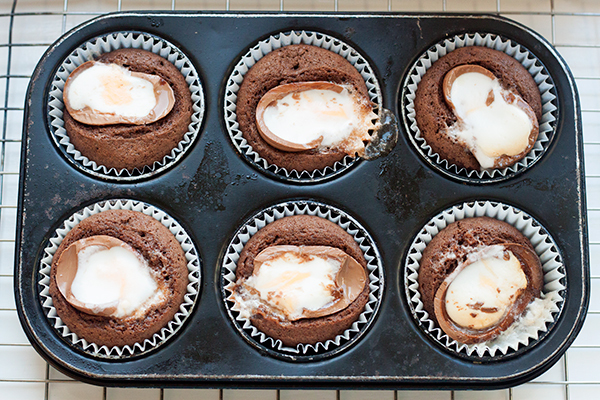 Cut your creme eggs in to half and place a half in to each cake pushing down slightly and continue to bake for a further 6 – 8 minutes. Once your cakes are cooked leave them to cool down. To make the butter cream beat the butter until smooth. Slowly add the icing sugar by sifting it in and mixing in in little stages (this bit is messy!). Add the milk and vanilla and mix until smooth and thick. If your cakes are cooled then you are ready to pipe on top of your cakes. Decorate how ever you like just make sure you hide the Creme Eggs leaving your friends and family pleasantly surprised!